US retail giant Target will raise the minimum wage it pays its employees to $9 (£6) an hour after rivals announced similar moves, according to reports. The wage rise would begin at all of its 1,800 US stores in April. The move follows announcements of wage increases by the world's biggest retailer Walmart and TJ Maxx owner TJX last month. US labour groups have been petitioning for a "living wage" at retailers and fast food restaurants. The US federal minimum wage of $7.25 an hour has not increased since 2009 despite efforts by US President Barack Obama to boost workers' earnings. 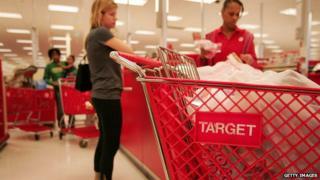 Target has said that it pays higher than the federal minimum wage in all its stores. The company did not respond to BBC requests for comment. Walmart led the charge when it said that it would pay its employees the $9 minimum starting in April and workers with about six months training would receive a minimum of $10 an hour in 2016. TJX soon followed after, announcing it would match the $9 amount in June at its TJ Maxx and Marshalls stores. Target, meanwhile, has been facing pressure to raise wages after women's advocacy group Ultraviolet ran an online petition against the retailer that garnered thousands of signatures. The moves come at a time when the US economy is growing, with the unemployment rate at 5.5%, the lowest level in six years. However, wage increases have not come to many workers, despite encouraging signs of growth in the world's largest economy. In 2015, the minimum wage in 23 US states and Washington, DC is set to rise to varying degrees, as a result of voter action in the 2014 midterm elections.